To expand on the scope of this thread, here is where I've been spending most of my time the last couple weeks...starting the spring summer garden. I think I have posted earlier that one of our directional goals is to be as self sufficient as possible on the farm. That includes not only the critters we eat but fruits herbs and vegetables as well. I don't think I have ever posted that my wife and I are lifelong endurance athletes competing in numerous races up to marathon distance as well as many triathlons including multiple 70.3 races. Been part of our lifestyle. To support that nutrition has been an important part. So let me introduce you to my garden. 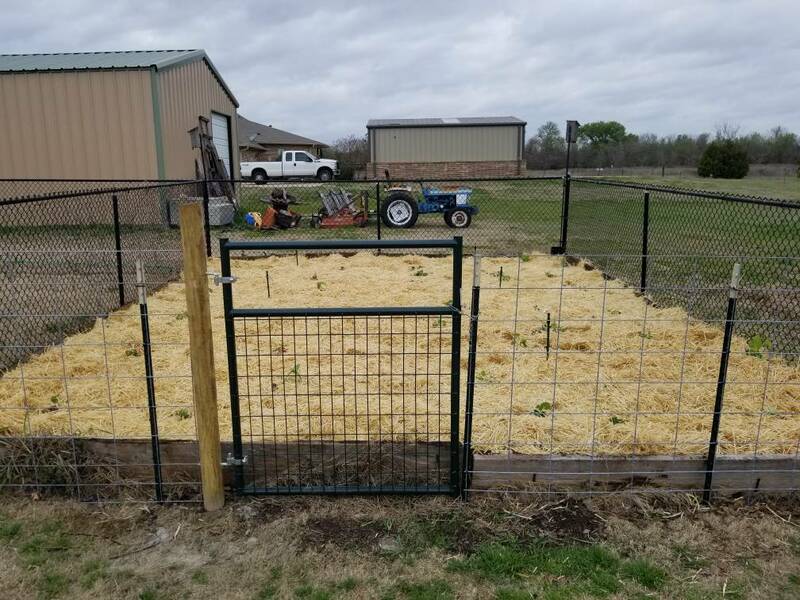 It is built on the 'back to eden ' gardening principles where I use deep mulches of alfalfa hay to eliminate weeds, provide fertility, and continually improve the soil. Been totally organic for years. I grow everything year round. The garden is also complemented with expensive fruit orchards, strawberries and citrus ...though I'm concerned the freezes this winter killed a lot of the citrus. To be seen. Here is a view from the top. The rows are 40' x 4' . You can see a row of blueberries in the foreground. Last edited by elgato; 03-17-2018 at 03:51 PM. Here are the top 3 rows. We have red,white and yellow onions, green onions, newly planted tomatoes, red, purple, yellow and orange bell peppers,spinach, rutabagas,roma tomatoes, carrots ,swiss chard, collards, red mustards, and red kale. The middle row is lettuces of various colors, then red and white potatoes. I also have a tabasco pepper tucked in out of sight in the foreground. The bottom 3 rows have broccoli in 3 different stages, cauliflower, more tomatoes, beets, radishes, snow peas, red cabbage, napa cabbage, and green cabbage,regular and Japanese eggplant, 3 kinds of garlic,4 kinds of kale, more spinach at the last successional planting and arugula. Lastly is the asparagus bed. Its just getting started but we are already picking from it. I will continue planting as space permits and crops come out. There will be beans and peas, okra,squash of all kinds, cucumbers, lots more peppers, and other stuff I'm not thinking about now. Life is delicious at the farm! You can make one heck of a salad rusty! You have quite the green thumb. Good looking garden. How do you keep the deer from getting it all? Good looking garden Mr. Baker, I like the posts that show other aspects of “The Farm.” Endurance training and races? Huge garden? Huge Mexican ranch? Huge deer farm? What do you do in your spare time? Are you still involved in your business? You sir, are extremely talented. I've been mostly retired since 1998 when I sold a company I was ceo of . I am still Chairman of a family business but not very active. That leaves lots of time to obey my wife. Hmm? without going back thru the thread I'm not sure which 3 yr old you are referring to? Which post? That goes back a ways. We lost that buck. Saw him for couple years after that then not sure what happened to him. Interestingly that was his most interesting rack . He got quite nontypical after that. It is also possible we were off on his age a year. Gato...I am motivated by your no till drill, overseeding and layover mulching. Awesome! We've had quite a bit of flooding over the last month with the water just now starting to recede. Unfortunately found this guy as we have had access to more area. 8 pt with small point off base. 168" . Here's what he looked like alive. A bull!. Dang, even your small deer are monsters. Just curious, have you ever had issues with poaching? Not sure of his age. Either 5 or 6 best guess. Poaching used to be rampant in our area. We actually had to hire armed , uniformed sheriff to patrol property. Today I don't think we have any problem and haven't had a problem for about 15 yrs.Both my neighbor and I live on the property and watch it very closely. So let me introduce you to my garden. It is built on the 'back to eden ' gardening principles where I use deep mulches of alfalfa hay to eliminate weeds, provide fertility, and continually improve the soil. Been totally organic for years. I've had a heck of a time keeping the weeds under control in my garden, especially the last three years. I've barked mulch, cardboard, cloth weed barrier, etc with not much success. Saw what you did, so I'm going with a thick mulch base of straw this year. Hoping it works out. Looks great. Check out some of the youtube videos about Paul Gautschi and the " Back to Eden " gardening concept. You may find it interesting. There is one that is about 1:40 which while long gives a great overview. Plenty of shorter ones as well. All interesting. Are you asking how I keep deer out of my garden? The garden is in my yard close to my house. It is also outside the game fence. My neighbor is also an avid gardener. His home and garden are inside the fence and he does have the occasional deer in his garden. He uses a motion activated sprinkler. It's gotten me before stealing his vegetables. Quite a surprise. Built a jig that allows us to put roller crimper on FEL while using drill on back of tractor. Experimenting with it this morning to learn how it works. We are starting to crimp fall elbon rye in preparation of spring planting which could start as early as next week depending on how wet it is.Will report progress. The crimping action seems as effective being pushed backwards but the tractor is harder to steer. Definitely a learning curve. We have put the crimper on the back now and will continue with several fields we hope to crimp before the rains hit.PLan to start planting straight soy bean fields next week if not too wet. Interesting. Do you spray your fall plants also or just crimp them? [QUOTE=Dushon;13275473]Interesting. Do you spray your fall plants also or just crimp them? The crimper will kill the rye. Before I start planting I will look closely at the fields to see if weeds are going to be a problem. If so I will spray the fields I am planting in a combo cover with gly before planting. Where I am planting straight soybeans I will wait till beans are up growing well then spray with flex star which will knock the weeds back till the beans canopy and shade everything out. The ultimate plan is for the rye to be thick enough to create a thatch that smothers weeds allowing the crops to get a head start and canopy before weeds can get going. My fields aren't there yet. I’m pretty sure I’m messing up. But I started planting my spring stuff into my fall plots this afternoon. I usually don’t plant til mid April or so but my boss wants to plant before the rain we’re getting this week and he pays the bills. Drilling into existing wheat, rye, and crimson with some radish and turnips mixed in. I’d like to let the crimson run its course, don’t particularly care about the wheat or rye anymore and the turnips and radishes are already done with. So I can’t spray it, but that crimper is an interesting way to get rid of the stuff you don’t want anymore. Doesn’t affect your clover I’d imagine? Correct, the crimper doesn't kill the clover. What are you planting? Depending on what the weather does you might be ok.The drill will do an ok job of mashing down the small grains and even if the radishes or turnips bolt its not a big deal. Depending on what you plant you can spray later with good results. Later spraying is why I don't like to mix grasses and legumes in the summer mixes. I watch the farmers around my area and poach on their schedules. Mostly soybeans with iron and clay mixed in. Was supposed to be the other way around but the co-op kind of screwed me. Have sorghum in the small grain box. Here's a sight that makes a no till cover cropper happy. A 12 acre field crimped and ready to plant.I'll wait a couple weeks for it to warm up a bit first. I'll be planting a combo mix of sunn hemp, cow peas, soybeans, sunflower, and buck wheat. Good for the soil. Good for the deer. Haha, works on deer and people. Ok, was just curious. Looking for ideas. So you will no till drill into this? I really wish you would write a book. I'd buy it. So much info here but the format is difficult to go back and find some things. I have the pasture, tractor, shredder, sprayer, and a broadcast seeder, but not a drill. And I don't want to buy one and just waste my time and money on seed and fuel to grow weeds. Holy cow, how much do you think that deer weighed? That’s unreal! Talk about a great mulch layer, building lots of organic matter and preserving moisture. That looks amazing! I wish we could get elbon Rye or any other crop to grow that well at our place. Keep up the great work! As with many things the nutritional content of clover 'depends'...Stage of growth, type of clover, soil nutrition etc. But all in all a very high quality feed with some clovers rivaling alfalfa for quality. Frequently protein content is in excess of 20% with very high digestibility. I do no predator control. Never have. If I shared my full belief system on predators, habitat ecology, and natures symbiotic relationships I would probably be run off the green screen. And yes we have all predators native to our part of the country. A very short version is that I also have a ranch deep in the heart of the Rio Grande brush country. We have as many predators as the country can support including lions, and a very healthy population of coyotes. Our habitat is very healthy and I see almost no predation problems. The exception to that is occasionally I have to address lions...never coyotes. I can elaborate in great detail if interested but know that we hardly ever loose bucks once they get old enough to be identified. OK, I'll give it a try to explain my approach. I view both the ranch and the farm as holistic ecosystems. Meaning I consider all aspects of the environment , fauna, flora, the microbes and unimaginable soil life and everything in between as vital to a fully functioning healthy ecosystem. When I'm in the environment I want to see life in all its forms flourishing. I believe it starts with vibrant healthy soil then works upward to the 'highest' life forms [ if one wants to delineate the value of life forms?] So healthy soil yields healthy grasses and forbes, yields healthy shrubs, yields healthy trees, yields healthy mice and rats yields healthy rabbits...and on up the spectrum. Predators fit right in there and have a critical place in achieving balance. Like anything in nature I believe excess pressure or support of any aspect of the overall ecology can have unintended consequences. Balance is valuable. However we all know that nature achieves balance in sometimes harsh ways from our perspective.The cycles of nature can be long and extreme. so many of us as managers try to moderate balance in shorter cycles according to our value system or priorities. For example we try to keep deer populations in check to avoid the big picture cycles of population explosion and crashes. Or we try to reduce or eliminate predators presumably to increase fawn survival or maybe because we just don't want to see them cause we would rather see more deer. Many times our focus can be misdirected because the building blocks of the habitat are the issue and thats where the solution lies.Simply stated , if we had more grass, would we have more mice rabbits etc thus have easier meals for the predators. If we have a balanced deer herd ratio, would we get tighter fawning with higher survival because of numbers hitting the ground at the same time with abundant grass to hide in? To me it all fits together. Now, all that said, I have no problem with the occasional predator hunt. Its fun and I think nature replenishes quickly. At the ranch we have had lions get out of control and we addressed it. Take one or two out and problem solved. Beyond that there has been a strong lion population in our country since the day I arrived. Nonetheless we rarely lose mature deer once we start following them . And anybody that has ever seen a lion while tooling around the ranch comes away super excited. Its a rare and rewarding sight. Last edited by elgato; 04-08-2018 at 02:05 PM. Thanks for taking the time to explain! What’s the best method for removing lions? Goat in protected compartment in trap. Takes patience but works. Dogs are frequently used. I have had mixed results mostly poor. Unless you hit a hot trail its tough to bring dogs in cold with success. That said we once had an old male that started killing colts. He had been around for years but such behavior got him in trouble. Brought dogs in and after chasing him over 3 ranches got him. Ny favorite lion chase though involves an old Mexican named Enriche[sp?]. Years back he took his dog and while riding a horse chased a lion up a tree. He took out his lariat, roped the lion in the tree, tide the rope to the horse. Then proceeded to kill the lion with a bat. Amazing the horse was more afraid of him than the lion. All said there is no easy way to get lions. We generally see 2-3 every season and always get pics every year. Looks awesome! I need to build one for my lease. Enriche is a bad bad man with big stones. You gotta love a crimson clover field in all its glory. This a 13 acre field I plant in sunflowers for dove hunting. It was originally planted in crimson several years ago...5 or 6? maybe more...and has done a great job of being a reseeding annual. I haven't fertilized it in forever. Just let the crimson feed the sunflowers. Mr. Rusty, how is the high water/flooding affecting you guys this spring? We dodged a bullet at our camp in Larto......water was close to getting in but we made it with little damage. The Black River still has our fields flooded in Jonesville under the bridge and it looks like we will be planting soybeans instead of corn on it this year. Uncle and cousin on the Delta are not sure if they will get to plant over half of their acreage due to flooding! I've been dreaming and scheming about this for a long time. Crimping and drilling at the same time. This , a 10 acre field in straight soybeans. I see some seed on top of the thatch but appears plenty is getting good soil contact. I crimped this field a few weeks ago but some of the rye sprung back up. My guess is that I was a bit early. More to come on this adventure. So you just drill into the existing plot and do not spray it but let it just die off?